Has your battery died in the middle of a highway? Are you stranded by the side of a road in an unfamiliar neighborhood, desperate for help but you cant jump start your car battery? We know how tough this can be. Most of us have had to get help to start a dead battery at one time or another — and Newway Towing is here for you at any time of the day or night! The techs we cooperate with will provide you with just the type of service you hope to get and all for a price that’s hard to beat. Newway Towing – Getting You Back on Track! Your battery can run out of juice at the most inopportune moments. Maybe you’re driving to a crucial meeting and every second counts. Perhaps you’re about to pick up the kids from school before taking them out for a special dinner. You could even have a plane or train to catch with no time for delays. It can happen at any time, any place. You don’t want to ask a random driver or passerby if they have jump cables you can use — you want help from reliable, safe professionals who know exactly what they’re doing. And that’s us! Just pick up the phone and give us a call, wherever you are in San Rafael. We will come to the rescue and will jump start your car. And if you car battery is out of service – we will replace it in no time! 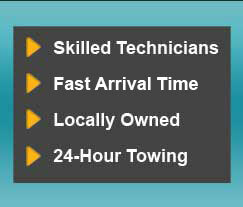 Newway Towing is on call 24 hours a day, 7 days a week. You can trust our team of experienced, dedicated professionals to give your vehicle the jump start it needs without having to worry about opening hours or delays. In short: we’re here exactly when you need us! No ifs, ands, or buts. It gets better, too. Our professionals will arrive on the scene as soon as they possibly can. Each member of the Newway Towing team will show up with a friendly attitude and the tools they need to help you on your way, no matter how early or late the hour may be. Newway Towing is passionate about being part of the local community in San Rafael. We know just how crucial it is to have a towing company you can trust on hand day or night. You want battery jump starts from an experienced, highly-trained professional who doesn’t take your custom for granted. We work hard to build and maintain strong bonds with the local community, so you know you can trust us every time you give us a call. All of our licensed, bonded, and insured technicians are trained to perform jump starts on vehicles of all makes and models, and are equipped with the latest tools to do the best job they can. They’re happy to answer any of your questions and will always make sure you have everything you need. On top of all this, our honest pricing policy guarantees you’ll pay what we quote over the phone. And our rates are always competitive, fair and reasonable. Want to learn more about Newway Towing’s battery jump starts? Have questions for our team at any time? Just give us a call on (415) 870-3377!